Submitted photo Cedadrville University women’s volleyball senior Taylor Wilkerson (center) is joined by her parents, Mike and Christy Wilkerson, prior to a home match. CEDARVILLE — Senior volleyball player Taylor Wilkerson may not have had a choice but to choose Cedarville University for her athletic career. But that doesn’t mean she regrets it. Wilkerson’s grandparents and parents attended Cedarville, and she can count over 40 extended family members who have been students at the institution over the years. While attending Cedarville may as well be a family tradition, Wilkerson said she didn’t know much about the university prior to attending. Her parents were far from forcing classic Cedarville buzzwords like ‘community’ or ‘intentionality’ into Wilkerson’s mind. Wilkerson stayed with her cousin, who was a freshman when Wilkerson visited campus for the first time. Coincidentally, her cousin lived in Printy Hall with a few volleyball players. The visit shattered Wilkerson’s assumption that volleyball players were disconnected from the rest of campus. Not only has Wilkerson enjoyed a culture infused with a love for God and a love for her teammates, but she’s also been able to witness to others on the court after every match. While she recognizes sets can get tight and matches can end in heartbreaking fashion for either side, more often than not, she’s still been able to pray for opposing players after nearly every single one of her matches in her four-year career at Cedarville. Wilkerson’s first head coach at the University, Doug Walters, instilled an attitude of unselfishness and took the opportunity to pray for every team they play, and new head coach Greg Smith has continued to reinforce this trend. Even when competition runs high, Wilkerson said teams are usually accepting to taking a letter from the girls and are accepting of prayer. While beating a team in a tight match may cause girls to be less receptive, it’s not been much of a roadblock, says Wilkerson. Wilkerson’s family isn’t only connected to Cedarville. Multiple branches of her family have affiliations to South America, with specific missionary work in Brazil and Portugal. Wilkerson visited Brazil in early elementary school where her grandparents were missionaries, but doesn’t remember much from the trip. She said she intends to return one day. That step should be a little easier, as her fiancé, former Cedarville soccer player Paulo Pinto, hails from Brazil. Upon graduation, Wilkerson plans to live in Chicago as an elementary teacher. However, the two have expressed mutual interest to return to Brazil long-term. Now closing in on the final part of her career, Wilkerson reflected on her time on campus. While her family was rooted in the corn fields of Cedarville, Wilkerson’s experience has been unique with the Yellow Jackets. “I love that we’re very open with each other. We’re closer, because of the bond that we share as sisters in Christ. We spend so much time together and that helps us walk with the Lord,” she said. She said she wished she would have soaked up her time with the Yellow Jackets more and that the four years at Cedarville went by faster than she thought they would. For more information on Cedarville University athletics visit www. yellowjackets.cedarville.edu. 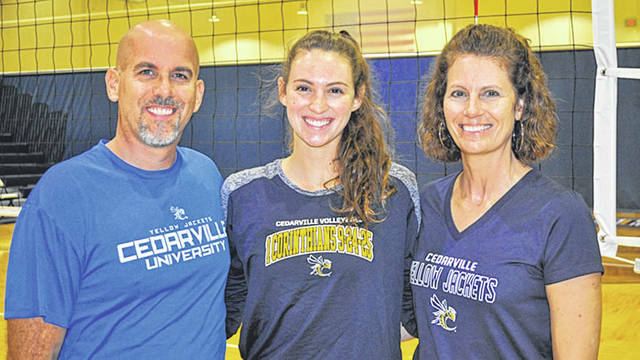 https://www.fairborndailyherald.com/wp-content/uploads/sites/50/2018/10/web1_taylor02.jpgSubmitted photo Cedadrville University women’s volleyball senior Taylor Wilkerson (center) is joined by her parents, Mike and Christy Wilkerson, prior to a home match.